a collection of specialized tools for IT professionals and power users. These powerful tools in the right hands have many uses such as virus and rootkit removal and repair, installation of software and drivers, and much more. Use the included sample scripts and documentation for installing Windows drivers in your image deployment (restore) scripts to support different hardware. The collection of tools include TBOSDT, BootFile, TBOS, TBCMD. TBOSDT Professional is available to paying customers. The Professional version gives you everything in the standard version plus the powerful TBScript engine and extensions that allow you to provide interactivity, logic, and mathematics in your scripts. TBOSDT (TeraByte OS Deployment Tool) standard is a specialized command shell that supports an advanced set of commands to perform various tasks related to OS deployment, as well as more generalized types of tasks, such as file management. All commands can be executed manually from the interactive command shell, as well as automatically from a script. 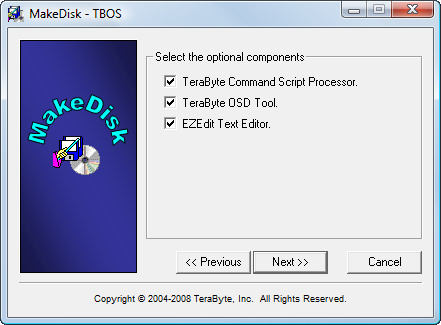 TBOSDT is compatible with DOS, Linux, and Windows (all NT versions 4.0 or later). BootFile is a utility that enables to you boot an OS from a raw file (up to 4GB) containing a FAT/FAT32/NTFS file system . Qweas is providing links to TeraByte OSD Tool Suite 1.33 as a courtesy, and makes no representations regarding TeraByte OSD Tool Suite or any other applications or any information related thereto. Any questions, complaints or claims regarding this application TeraByte OSD Tool Suite 1.33 must be directed to the appropriate software vendor. You may click the publisher link of TeraByte OSD Tool Suite on the top of this page to get more details about the vendor.